Have you been searching for the ideal watch to match your individuality and sleek style? Look no further than the uxorious, classic Mens Tag Heuer Carrera WAS2110.BA0732 Timepiece. Silver and black make up the color scheme, two hues that match almost every outfit, including your suit. Handicraftsmen engraved a sunburst guilloche over the black rounded dial. 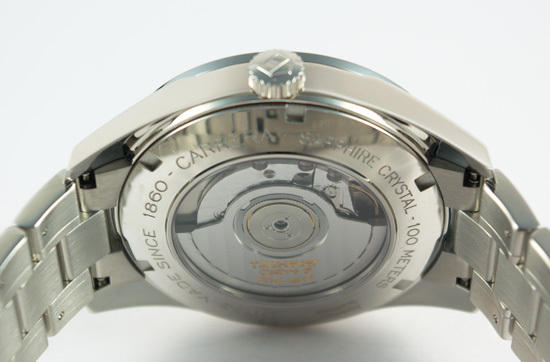 The outer edge that meets the thin sliver of silver bezel on a raise flange exhibiting the seconds to each minute with tiny notches and numerals on the fives. On top of the dial, large Arabic numbers are easily read from afar to track the time on-the-go. Slick, silver-toned minute and hour hands eject outward from the center. The Tag Heuer logo displays atop the collection name and caliber number just above the hands. Above the six o’ clock display, a tiny black rectangle reads the correct date of the month. Extending from the clock to the hands, you will find a sub-dial featuring a compact running-seconds hand in silver. The entire dial is encased by an anti-reflective, scratch-resistant, slightly domed, sapphire glass. This should counter the florescent lighting brightening your office without blinding you. This Swiss-made Carrera features an automatic movement working at Caliber 6, beating at 28,800 vph with a power reserve of 44 hours. It is water-resistant up to 100m for the typical coffee spill you experience weekly while walking from the kitchen back to your office with a fresh cup of caffeine to a trip to the local pool with the kids. The case and bracelet are made from a strong, polished stainless steel. The chain-link bracelet appears to be in motion with its five-across, brick-pattern links. The 8-inch strap reaches around to a fold-over clasp. Before Brangelina, there was just Brad, and he makes an excellent spokesmen for the type of man the Tag Heuer Carrera watches were designed for. 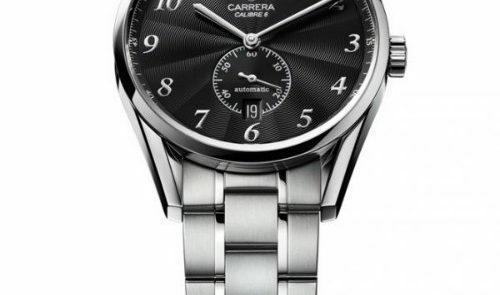 His practical, man-on-the-loose personality is easily interpreted by the Carrera collection. This attracts a variety of roles such as a sports fanatic, businessman and dad like you. While you can take this timepiece swimming, surfing or even tubing, it is not suitable for diving. Leave it at home for your next scuba diving lesson. You would not want to drop it in the ocean anyway. Speaking of losing things, this watch is adjustable only by removing links, which is better fit for a professional. But once you size it to your wrist, it should stay fastened tightly. The links also tend to grab onto your arm hair, occasionally pinching. It is much more comfortable than an elastic link watch, so this should not sway you away from your purchase. 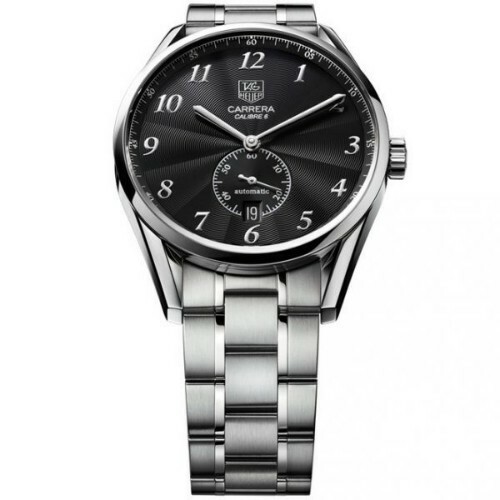 Overall, you will not be disappointed with the Mens Tag Heuer Carrera WAS2110.BA0732 Timepiece. It will become not only a wristwatch, but part of whom you are.